I just got done with a sequence and its stored under recent sequences. I am not sure why it stored here. I want it with my other sequences but not sure how to move it to my existing sequences. Are you talking about the Sequence Editor? If so, then what you are seeing is nothing more than a visual representation of your sequences. They are still stored in your Sequences folder, but it's just being shown to you in different ways in the Sequence Editor. How can I have the sequence editor find the correct folder? I did make a new folder with my sequences but not sure how to get it to read the new file. OK I did that and that did not work also. keeps going to sequences. I did the steps and loaded my 2015 folder and when it loads into the sequence editor it skips past that and go's to sequences. the sequence folder has all of my work also but when its in the sequence editor only samples come up. Just taking a stab in the dark but what is your current directory in Sequence Editor set on? Is it possible you changed it and forgot to change back? To set the default directory you can click the arrow to where you want it to be as shown in the pic below. It will always go there until you change it. I can see Alan's pic just fine. You might be having pc issues and not necessarily just LOR issues. I hope you can eventually see it as Alan's pic is a good place to check. Strange, I just looked at it with 2 other computers and an ipad it came right up. Anyone not seeing it? heh Mega Arch beat me to it. that's is strange! I looked on my I-Pad b-4 I posted that. Could not see anything on both. This is getting frustrating! If it helps, PM me your email and I send it that way. I cant see the picture either. Thanks for the info, strange goings on heh.. I looked around LOR and tried to see where I could upload pics, finally gave up and put in my hosted web space. I noticed rednosetbird had an att address, I wonder if that has something to do with it or if it is a browser issue? anyways I sent him the pic email so hopefully he can get the original issue resolved. @ItsMeBobO can you see the picture outside of the forums, ie opening in a browser window? You don't have permission to access /LOR Pics/ss1.jpg on this server. Ah thank you, it's on my end then. Still strange why some can see it and others not. I think I found my issue, I had setup a .htaccess file on the server because I was getting massive hits from all over (non legit) I changed it back so hopefully it will work. Forgot I did that. OK now, I got your email and yes the file is open now on this thread. I have done that already and when I reopen the sequence editor it tells me it cant find the file!!!! ugh! I did do what Ron told me to do and just cant find it. If I scroll up to the file its there but will not open when it has been closed. So to make sure I understand correctly, your file is in the C:\Documents and Settings\your pc name\My Documents\Light-O-Rama\Sequences directory? and if you try to open it, it will not open? Will any other older sequences open? Are we dealing with Ver 3.12 or the newer beta ver just released? Yes Bill is the computer name and the sequences are under light o rama 2015. When the sequence editor opens and I get the error message, I can close the message and scroll down to light o rama 2015 and find all of my sequences and open them all. But I want to be able to open up the sequence editor and see all of my sequences under recent sequences. OK, try this. In the picture Alan sent you, he has drawn a red arrow on the drop down arrow. A couple a icons to the right of that is a LOR blue light bulb. Click on it and it should take you to the LOR preferred sequence folder. Then check the path it likes. Add your folders in it as sub-folders and do not keep trying to direct the program to go where it doesn't seam to want to go. As far as them being in the Recent Sequences, they would be there if they were opened, then saved again. It should list them in the Recent Sequences tab. In the Recent Sequences tab it also gives directory info about exactly where LOR Sequence Editor knows these file and directory names are. Do you have any of your files in the Recent Sequences tab? If so, look very carefully at the Directory path spelling and also the spelling of the filename. On the lighter side don't be this guy. OK here we go again. I did make a mistake I am fighting a cold. I should of said existing sequences. I tried to click on the blue light bulb and the error message comes up. I tried to click on the blue light bulb and the error message comes up. 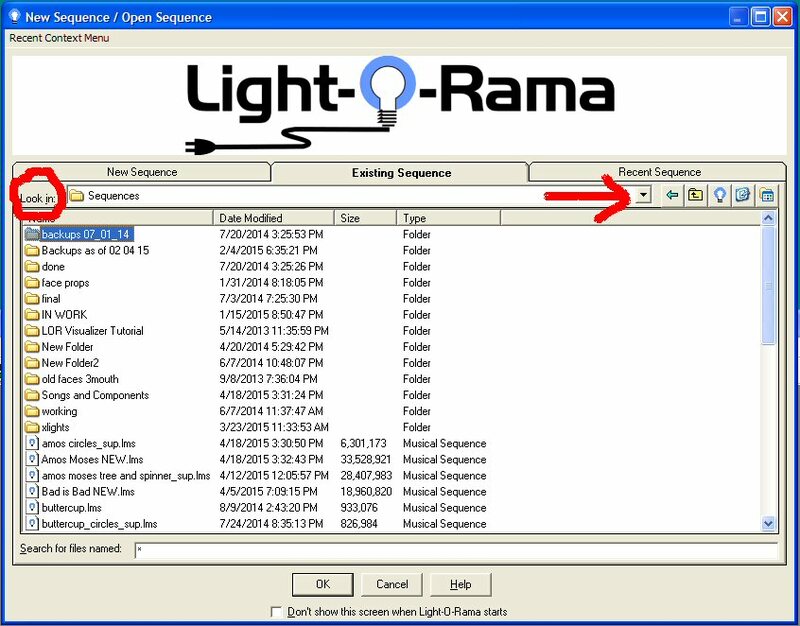 If i am not mistaken the default directory that Sequence Editor is C:\Documents and Settings\your pc name\My Documents\Light-O-Rama\Sequences. Did you rename yours to C:USERS\BILL\DESKTOP\LIGHT O RAMA 2015\SEQUENCES. That would explain why it errors when you click the blue light bulb. It's seems like it's trying to find a Folder that doesn't exist anymore, possibly because you renamed it ? So the question now is do you have a folder called C:\Documents and Settings\BILL\My Documents\Light-O-Rama\Sequences? Yours says DESKTOP, which is probably ok, however if you don't have the default directory C:\Documents and Settings\BILL\My Documents\Light-O-Rama\Sequences then Sequence Editor is telling you it can't find it, thus the error. If you don't have one (possibly because you renamed it) then we can go from there. Don't get frustrated, it's just not easy to give help by not being able to see your screen. To that point here is a link on how to take a screenshot http://forums.lightorama.com/index.php?/topic/32359-please-dont-take-a-picture-how-to-take-a-screen-capture/ this would help help a lot. If you can't post the picture in the forums, email me the picture as an attachment. For what it's worth I had the same problem. And It was as default said. I had changed the name of my LOR folder,forgot about it. Then one day went to start sequencing again. And boom. Got your message. Once I changed it back. I found them instantly everything was right where it should be. . So try what he says. That's prob the ticket. Good luck. Alan, just got all my sequences back where they should be. 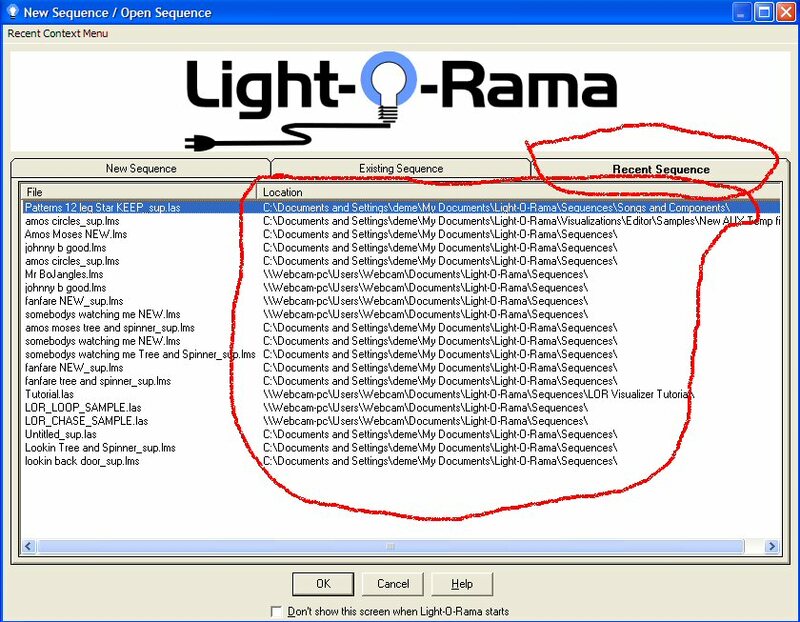 I think what happened was I made a new folder "light o rama 2015" and I deleted my folder where the sequence editor was looking. So what I did again was done what Ron said to do. But had it search for the missing folder. When back into the sequence editor, and there must be a default folder with samples. It had chases and something else. So I went under start, search, typed in sequences. clicked on folder and the default sequences where there. So... I opened up the 2015 folder and copied all of the sequences and pasted into the other. Then I opened up the sequence editor and it all worked!